Lord Mandelson tonight accused the Tories of failing over the single market by putting their own narrow party interests before the health of Britain’s economy. The former business secretary said Theresa May could not expect to retain the “exact same benefits” of being in the single market and customs union if Britain seeks to leave them. 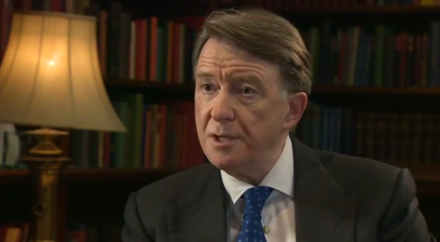 Mandelson, a key advisor to Tony Blair who also served as an EU trade commissioner, said the Tories had “put politics before economics, insularity before the national interest” in the year since the vote for Brexit. His speech at the British-Irish Chamber of Commerce in Dublin was his first major intervention on the economic impact of Brexit since Labour performed a significant u-turn and vowed to try to keep Britain in the single market after the negotiation period has concluded. Mandelson was a significant critic of Jeremy Corbyn in the early days of his leadership, and once claimed to be working “every single day” to unseat him, but has been less vocal on the subject in recent months. Tonight he attacked the Tories for refusing to acknowledge the reality of how the EU works. “Brexit was only the first choice made by the public, and it was a binary one. Every choice since has been made by the government from a range of options. And each of their choices has put politics before economics, insularity before the national interest,” the leading Open Britain supporter said. “Mars is speaking to Venus when ministers say it is simply a matter of practicality for the UK to have both autonomy on trade policy and regulation and a very high level of integration into the single market. The government cannot acknowledge that these two things are a trade-off and not a set of compatible aims.